The Friends of the Norwalk Foundation, Inc. is a licensed West Virginia non profit ( 501(c)-3 buisiness, who's charter became effective in September 2008. 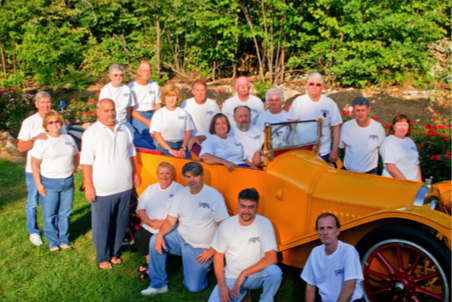 The foundation was formed and chartered for the purpose of acquiring, purchasing and preserving a 1914 Norwalk Underslung Six motor car which was built in Martinsburg, West Virginia by the Norwalk Motor Car Company ( 1911-1922 ) and is thought to be the only known surviving motor vehicle produced by that company. The foundation is comprised by thirteen board members and a group of volunteers, which have monthly board meetings. Officers are elected annually and serve on a completely volunteer baisis. No salaries are provided to any member, and all funding goes directly, or indirectly to the preservation, transportation, maintenance and debts of the motor car. At such time that the motor car's large debt is paid, a move will be made to establish a permanent museum in Berkeley County, WV to house the car and other area artifacts related to transportation and automobiles. The initail debt on the car started at $300,000.00 - the purchase price, and is being paid back on a monthly basis through fundraising efforts and donations by the public. He is a long time member of the Norwalk Antique Car Club. He has been interested in cars and motorcycles since about age twelve, currently owning six antique vehicles plus collectable items from the local area. He is a life long resident of Berkeley County, West Virginia. He is retired military from the 167th Air National Guard in Martinsburg, West Virginia with 36+ years service. During his career he was deployed to many areas of the United States and countries. He deployed in active duty in support of Desert Storm and Iraqi Freedom. He organized or assisted with car shows that were hosted by the Air National Guard as part of their community activities. He is a life member of the Enlisted Association of the National Guard and 167th Non-Commissioned Officers Club. He is a member of the 167th Retiree Association and the National Association of Federal Retired Employees. He is married to Patty (Hilliard) Runkles and has a son and daughter. Mr. Runkles became interested in the acquisition of the Norwalk Motor Car so that it could stay in the Martinsburg/Berkeley County area for all to enjoy. She is a lifelong resident of Berkeley County, West Virginia. Having a great interest in cars, she has been associated with the Norwalk Antique Car Club for years with her husband, owning several antique vehicles. A life-time member of Communication Workers of America Retired Members Council, she was worked in WV, MD, and Washington DC for Verizon Communications; retired in 2001 with 34 years service. She is married to Galen Runkles and has a son and daughter. She is very committed to serving on The Friends of The Norwalk Foundation and being involved in perserving a part of history for the Martinsburg, Berkeley County, West Virginia.